In case you thought that free food is a rare event on campus – think again! One of my roommates and I went to Latinx Night recently, an alliance of many of the Latinx-oriented organizations on campus, from Latin American Student Organization, to Lambda Theta Alpha Latin Sorority, Inc., (the Latina-oriented sorority), to Alpha Psi Lambda Fraternity Inc. (our only co-ed Greek organization on campus focusing on the Latinx community; neither of them are exclusive to just Latinx students! ), to Organization Smile, a group dedicated to raising money to help children get cleft-palate surgery. They had free food from Cafecito, a very popular Cuban sandwiches location and tamales, brought by Alpha Psi Lambda’s members who couldn’t make it to the event. I always enjoy events hosted in the Damen Den – for one, there are couches to sit and lounge on, and two; it’s such a nice, central location, right in the middle of campus so everybody can meet at it. I have friends who are involved in all of the organizations, so it was really good to be able to see them all. For some of them to see that I was friends with their friends, we’re just a big interconnected circle of friends, made us all laugh! But that says a lot about Loyola student culture. We’re neither small nor large, so walking to class you typically see one friend for every thirty strangers (or so). But we do see our friends! Even if we don’t get time to catch up, my day is always brightened by passing them by and saying hi. It’s the same with social functions! 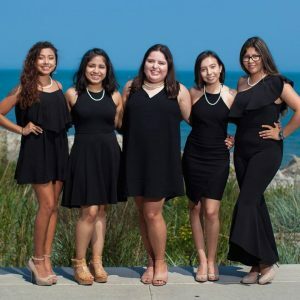 Here’s a picture of the sisters of Lambda Theta Alpha Latin Sorority, Inc. – I have pictures of their performance of a traditional salute, as it’s called, but it doesn’t quite do them justice. At Latinx Night, after some time of eating and listening to fun music, the treasurer and one of the presidents of Latin American Student Organization took the stage to give each organization time to introduce themselves. The highlight of the organizations was seeing Lambda Theta Alpha perform their traditional ‘salute’, a way of introducing themselves and their organization, as well as a little bit of their organization’s history and values, in a performative way that compels you to watch. I can’t wait to see more events from these organizations in the future – they’re always a good time! Although I’m not Latinx myself, it was totally inclusive and open to everyone. Loyola students come from all backgrounds and are going to all sorts of different futures, but we’re united in our values and our love for the community around us. Street Food? Free Food? Yes please! One of the hallmarks of a college student, as is the true stereotype, is our presence at most anything offering us free food. 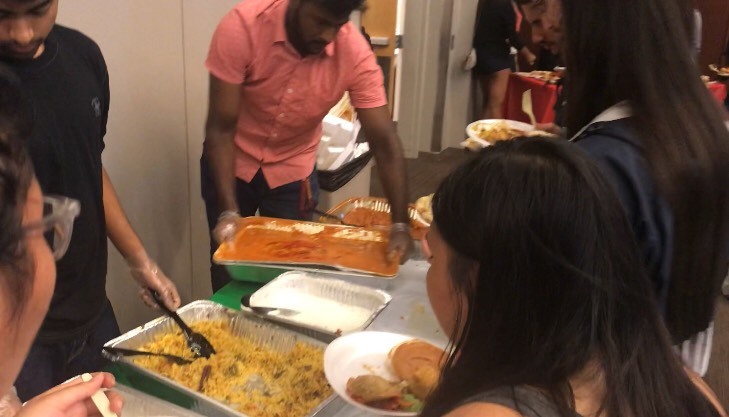 This was very visible last week at the Indian Student Association’s Indian Street Food Dinner, where many students waited in line for thirty minutes to an hour to get in the door! It was hosted in one half of our Multipurpose Room in our Damen Student Center. Although it cost money for anyone who wasn’t a current Loyola University Chicago student, it seemed as if most there were, in fact, students from all walks of life. Over 400 people RSVP’d on the facebook event they made, but it seemed many more went that had heard about it through word-of-mouth – the fastest way to hear about free food opportunities. I arrived with some of my friends at about 6:50, hoping we would be relatively near the front of the line. Nope! The line stretched from the room’s entrance through the whole second floor of the student center, all the way down the stairs, and that’s where we waited. And waited. And waited. We finally got in around 7:45, and to be honest we were a little worried if there would be food left! But there was plenty. From what was labeled (I think) ‘Chicken 63’ to pani puri to naan and butter chicken, there was loads of food. Warm and delicious, we were worried our plates would be too weak to hold all of the food they piled on there. Even though the line was long and the room was crowded with people laughing, enjoying themselves, and gorging on excellent food, my friends and I were able to find space at a table to fit us all and enjoy the powerpoint going on about members of the Indian Student Association, watch the line shuffle past us, and chat easily. I wish I could show you a picture of the food I ate, but in truth, I was much too busy chowing down to think about pulling out my phone! The food was absolutely excellent and totally worth the wait! I’m glad I went, not only for the free food but the chance to see the ISA at work and hang out with my friends. Loyola hopes to see more popular events like this from ISA, and not just because it was free food – we love it when organizations are able to get the student community together and enjoying ourselves! 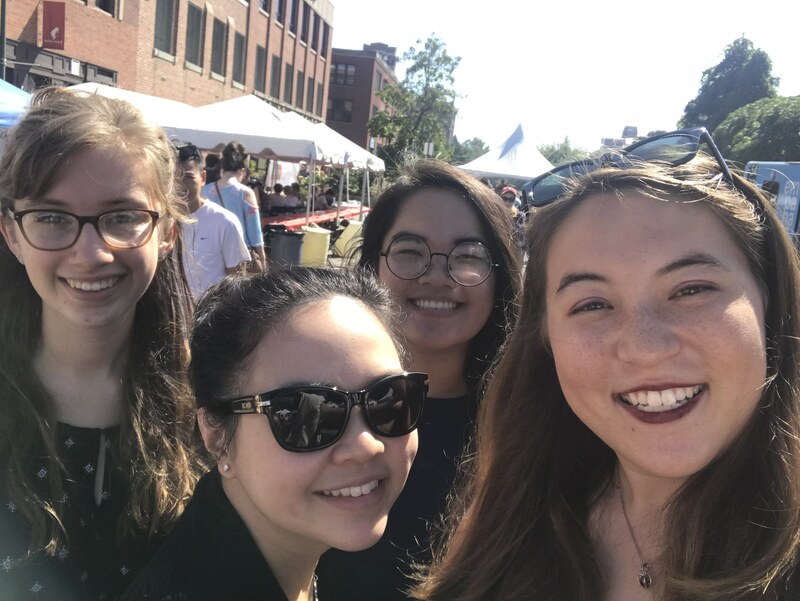 Around Chicago: Ravenswood Art Fest! With the thermometers taking a slow but sure tumble down the scale, summer is ending and the brief fall we have is getting into its stride. With the end of summer comes the end of such neighborhood staples like outdoor fairs and festivals, such as Argyle’s Thursday night food fest and Edgewater’s Art Festival. 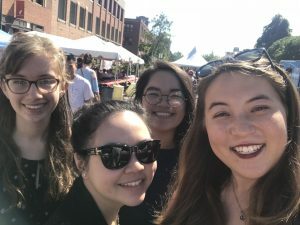 One of the festivals that came and went was the Ravenswood Art Fair, which happens annually just about thirty minutes from Loyola Chicago’s campus. I was able to go this year with my roommates from sophomore year, and it was so fun! Personally, I adore craft and art shows like these. I blame my mother – she does as well, and we’ve been going to different ones all of my life. In the winter, she even sells personalizable ornaments at some, which goes to show how much she loves them. So of course, even in Chicago, off I go. I found Ravenswood’s very cute and notable for many things that set them apart from other ones I’ve gone to, such as two beer tents pouring local craft beers and a sign on each stall showing where each vendor was from – and of course, all local (ish). I was sucked in immediately. It was very funny to me the amount of candle stands – one woman was selling a fall variety in jars with wood wicks, another stall specialized in candles that smelled like alcohols and came in their bottles with the tops cut off, another had candles all in second-hand mugs and containers rescued from garage sales and consignment stores. Another had expensive but fantastic quality ones in glass cups that could be used after the candle was done. I was in heaven. I love candles. I bought three from the first lady. I couldn’t have stopped myself if I tried. But the other shops were cool as well! There were jewelers, watch-part accessories, ink artists, photographers, and so on. Although Ravenswood wasn’t extraordinarily huge, it was big enough for us to have spent about two hours there, walking up and down and stopping to pet the dogs. Plus, next to one of the beer tents, there were food trucks and live music from (you guessed it) local Chicago bands. None of my roommates are from Chicago, but after almost four years here we feel pretty connected and very glad to be able to support the neighborhoods our adopted city. As we were leaving, Ravenswood showed us something else we weren’t expecting – drawn in by someone telling us about a ‘Cats Against Catcalling’ something-or-another with live cats, we walked into an old building to find an art exhibit by survivors of sexual violence, with scattered cats up for adoption around the floor we could interact with. Next to that area was a small natural history museum with free books (I nabbed a guide book to Britain from the ‘80s, for some reason). A cute show with good friends and excellent candles (the odds are high that when you’re reading this, I have one lit…) If/when you’re here in the late summer, I recommend checking it out!